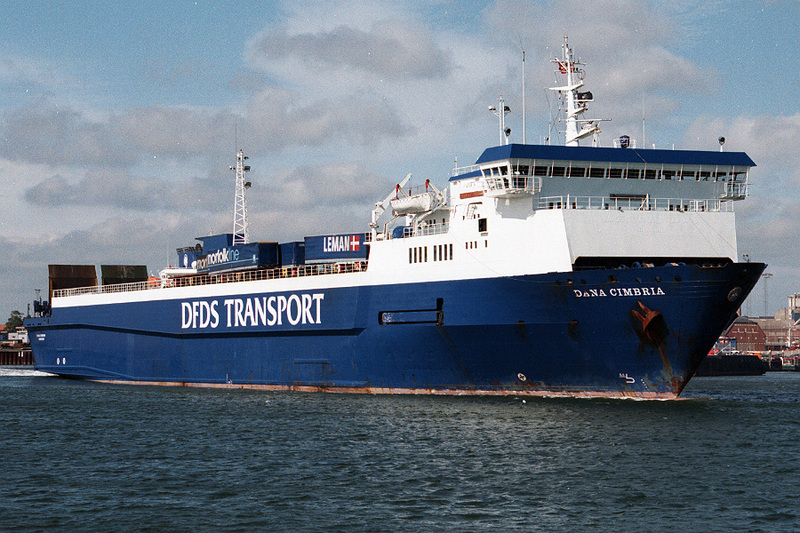 Det Forenede Dampskibs-Selskab (DFDS) was formed on 11 December 1866 as a merger of the three biggest Danish steamship companies under the leadership of Danish financier Carl Frederik Tietgen. 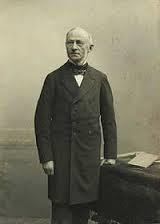 Operations began on 1 January 1867 with 19 ships with Copenhagen as the main starting point. 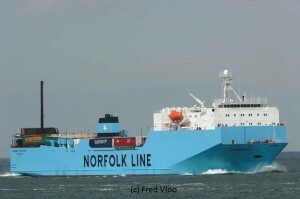 The company’s routes at the time were from Denmark to Norway, the Baltic, Belgium, the United Kingdom, Iceland and The Faeroe Islands, with ships carrying both freight and passengers. As the company grew, new connections were opened to Sweden, France, the Mediterranean and Black Sea, as well as North America and South America. 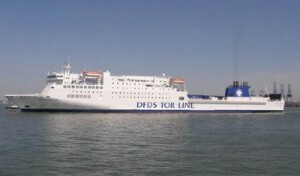 In addition, DFDS operated various domestic services in Denmark. 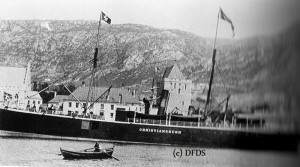 After continued expansion of the fleet in the 1880s, DFDS became one of the world’s ten largest ship owning companies. 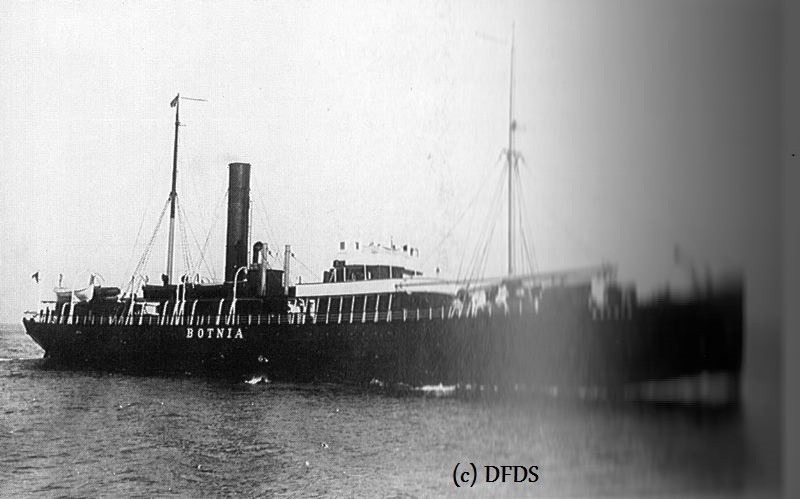 DFDS approached the Great Eastern Railway Company for permission to call at Harwich instead of the Thames Haven, agreement was reached and Riberhuus was the first vessel to sail to Harwich on the 2nd June 1880. 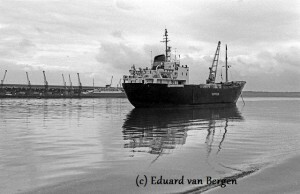 Later that year the new Parkeston Quay was completed and the Esbjerg service terminated there. 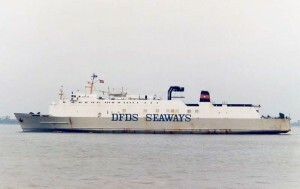 For many years, DFDS had marketed their North Sea passenger operations under the Scandinavian Seaways banner. 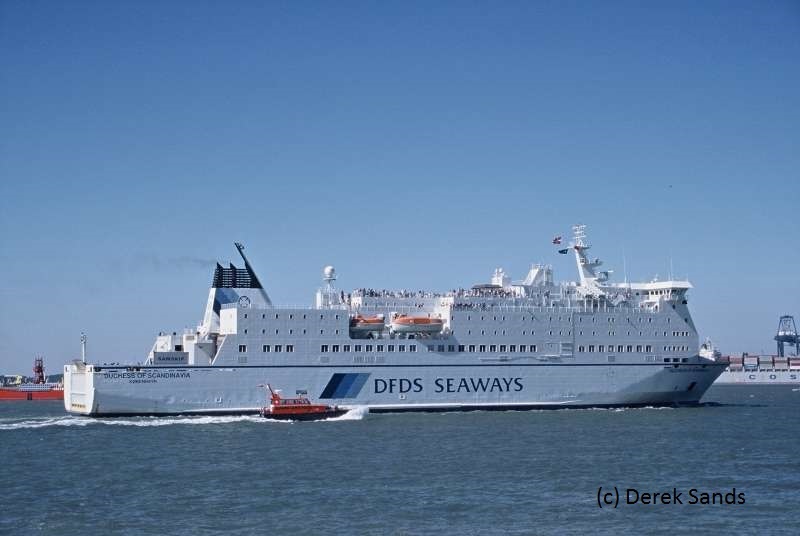 However, with an increasing emphasis on services serving Holland and Germany, the name was no longer appropriate, and they returned to being called DFDS Seaways in 2000. 30/08/1964: Arrived at Esbjerg from Grimsby for layup. 08/03/1965: Sold to Yugoslavia for demolition. 31/07/1965: Left Piraeus in tow for Split. 09/1965: Demolition commenced by Brodospas. A.P.Bernstorff entered service on the Harwich link in July 1913 and served on a regular basis until 1932. She was captured by the Germans in 1944 but returned to DFDS in June 1945. After the war she was mainly on the Newcastle route before being sold for breaking in 1957. History: Global Provider (2009) Ulusoy 4 (2006) Sengela (1996-1997) Arcade Eagle (1994-1996) Autostrada (1990). Yard. Rauma Repola OY, Rauma, Finland. 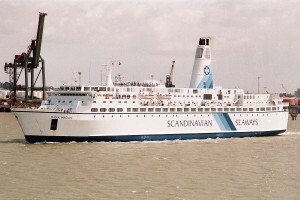 Chartered by DFDS 15/06/1995 Harwich-Esbjerg. 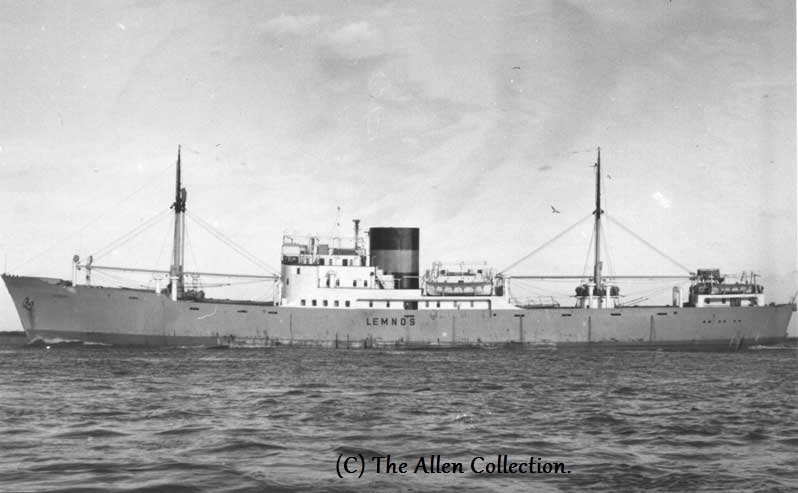 October 1940: On voyage Hull – Reykjavik with 300 tons of ice set on fire by a German air attack 4 miles E of Gourden, Kincardineshire. Nine men were lost. Drifted aground at Strathlethan Bay S of Stonehaven and wrecked. 12.04.1972: Sold to William Lines Inc., Cebu. 18.05.1986: Beached 2 miles off Tulungin Point. 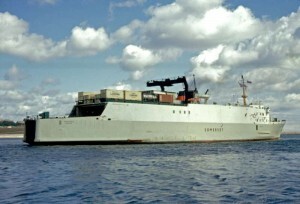 07.06.1986: Refloated and towed to Cebu. 1987: Sold to be broken up. 30/09/1961: Sold to Bruges Scheepssloperij N.V.
02/10/1961: Towed to Bruges for breaking. 08/01/1962: Demolition commenced at Bruges. At Parkeston Quay during the 1960s. 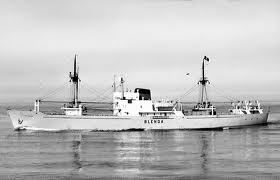 In 1971 Blenda entered service between Parkeston Quay and Copenhagen. Sold 17 March 1972 to William Lines Inc. Sank 24 December 1976 when fire broke out on board. 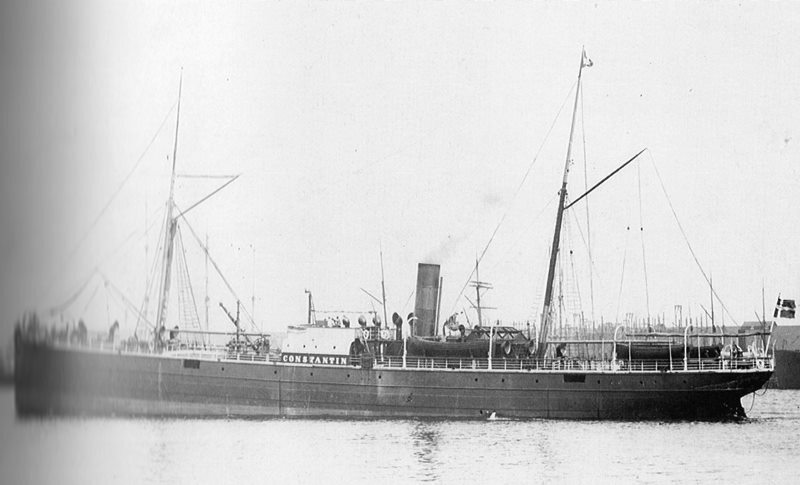 In service Parkeston Quay from 1892 until 1904, Sold 12 March 1935 to Bolckow Shipbuilding Blyth for Breaking. 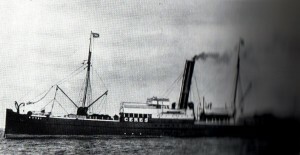 Seen here as Caribe Trader. History: Aristefs (1979) Sucre (1981) Caribe Trader (1985) Baby I (2000). 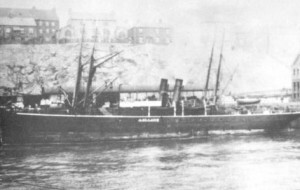 On voyage Fleetwood – Reykjavik 31/07/1917 with salt and general cargo, torpedoed and sunk by the German submarine U-88 in the Atlantic. Two men were lost due to the explosion. 06/04/1916 Sold to Asgeir Pjetursson, Reykjavik, Iceland. 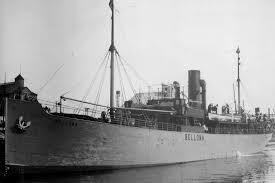 07/06/1916 Sold to Rederi Ab Holmia , Stockholm. 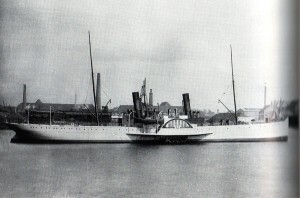 24/11/1917 Sold to Rederi AB, Malmö. Renamed Chand. 10/05/1918 Sold to Arthur Pott, Stockholm. 10/05/1918 Sold to Swedish-Russian Rederi AB, Stockholm. 09/09/1921 Sold to Carl Wallin, Stockholm. 09/09/1921 Sold to AB M, P & Co, Stockholm. Renamed Hammarby. 1925 Wrecked. Sold to Ernst Fuhr, Stockholm for Scrapping. 16.09.1891 Grounded on Rogneleiren at Aalesund. 28.04.1903: Sold to A/S Søndmøre Dampskibsselskab renamed Hjorungavaag. 1918: Sold to Rederi A/S Leif Bull, Skien. 1920: Sold to H. Haraldsen, Skien. 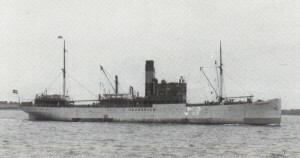 1921: Sold to Indherreds Aktie-Dampskibsselskab, Steinkjær renamed Havda. 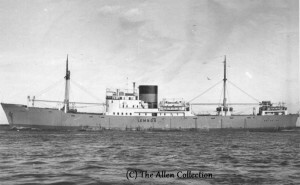 09.12.1944: On voyage Trondhjem – Bergen/Stavanger with passengers and general cargo attacked and sunk by allied aircraft S of Askvold near Florö. 06/10/1905: Grimsby-Trelleborg with coal abandoned by the crew after engine room was flooded. 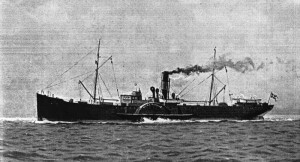 08/10/1905: Sank of Ymuiden in the North Sea. History: Dana Baltica (96) Vinzia E. (94) Norcrest (93) Wesertal (92) Meyer Express (73) Wesertal (72). Chartered by DFDS in 1989 for service between Parkeston Quay and Bremerhaven. 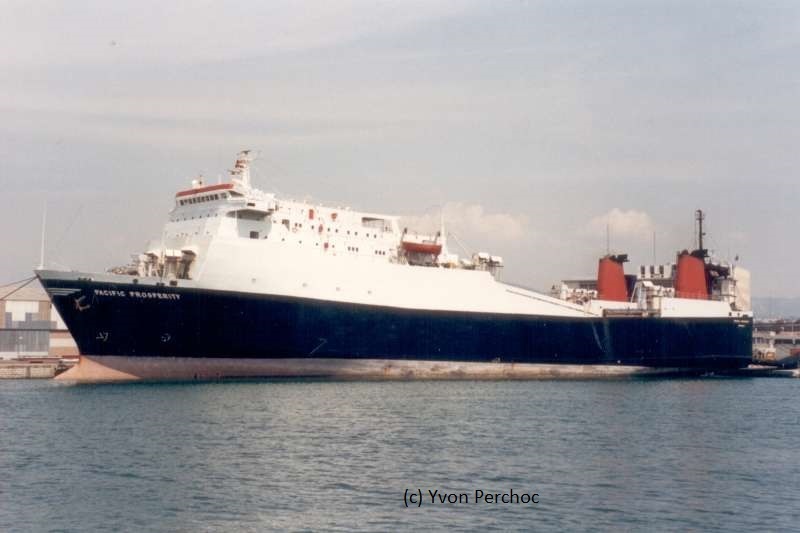 Chartered on the DFDS lolo service to Iberian peninsula, alongside Parkeston Quay 31st July 1989. Frey (2004), Kaja (2008) Austera (2014). 31/01/1923: Sold to Carl Marius Engholm, Copenhagen who sold same day for demolition. 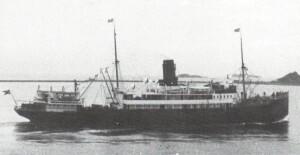 Originally built as Irkutsk for Lassman Bros between St Petersburg and London, Taken over by DFDS in 1920 and renamed Dagmar, Became a war loss in 1941 when she was bombed and sunk off Cape St.Vincent. 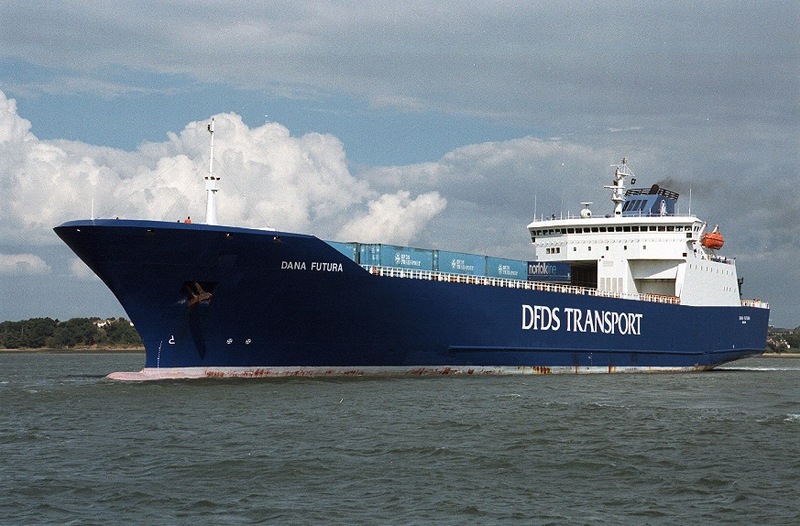 Dana Anglia was delivered to DFDS in 1978 for the Harwich-Esbjerg route. 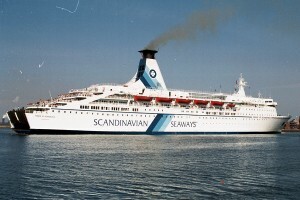 Between 1978 and 2002 before being renamed MV Duke of Scandinavia for service between Copenhagen, Denmark and Gdańsk, Poland. She returned to the North Sea in 2003 to sail between Newcastle and Ijmuiden. 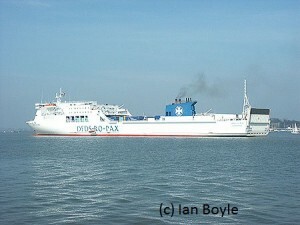 In 2006 she was chartered by Brittany Ferries to replace the MV Val de Loire, renamed MV Pont L’Abbé. 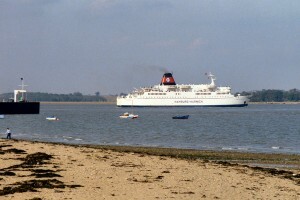 It was announced on 19 December 2007 that the vessel was sold to Brittany Ferries. 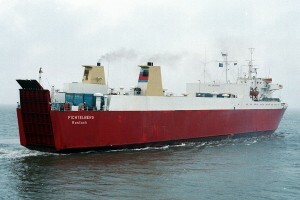 Her final sailing between Plymouth and Roscoff was on 9 November 2008 after which she was laid up in Saint-Nazaire. 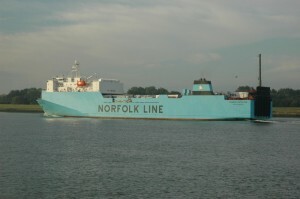 In October 2009, the ship was sold to Moby Lines. She was renamed Moby Corse and started the new service from Toulon to Bastia on April 1, 2010. 10/2002-12/2005: Sold to Norwegian interests and chartered back. 01/2006: Chartered to LD Lines, France and renamed Aquae. 3/1975: Hamburg-Harwich charter to Prinzenlinien until June. 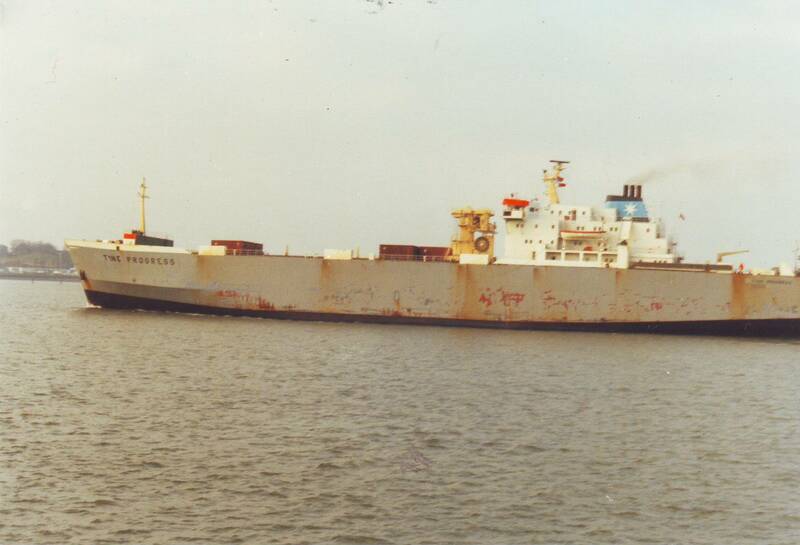 6/02/1985: Sold to China Ocean Shipping Co.
6/03/1985: Taken over and renamed Tian E.
2003: Laid up in the delta of the Yang-Tse River, Shanghai. 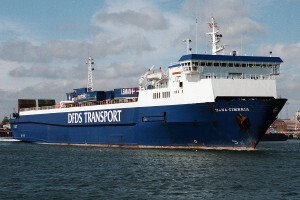 1991 Chartered to DFDS a/s. 07/11/1977 Chartered. 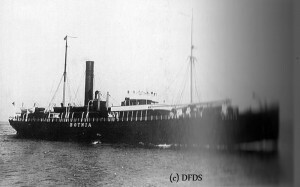 Renamed Dana Hafnia. 29/03/2010 Arrived Alang, India. for scrapping. History: Wellamo (1981) Dana Gloria (1981-1989) Svea Corona (1984-1985) King of Scandinavia (1989). 09/1994: Sold to Color Line renamed Color Viking. 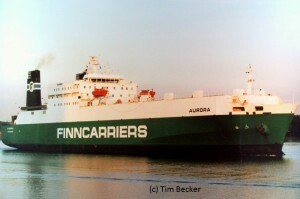 12/1998: Taken over by Fjord Line incl. renamed Jupiter. 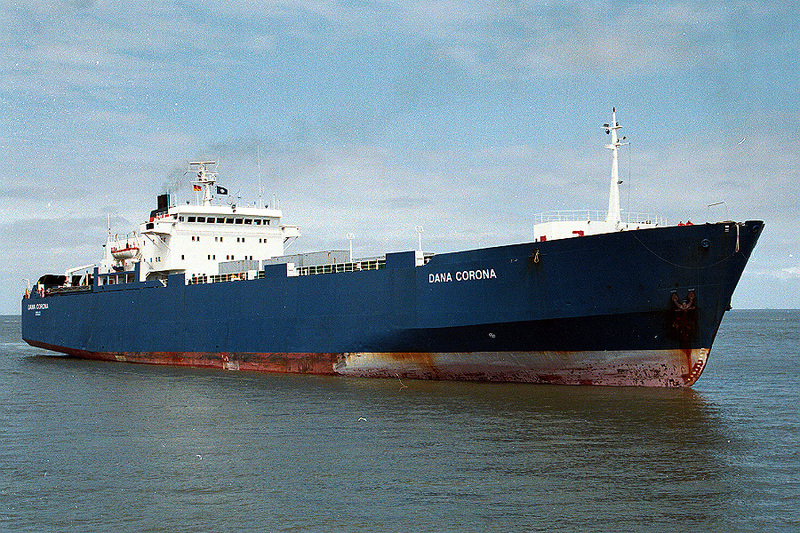 Dana Gloria was built in 2001 by Stocznia Szczecinska im. A. Warskiego, Stettin, Poland. She was ordered as Golfo Dei Coralli for Lloyd Sardegna Compangia Di Navigazione, Olbia, Italy, but was not delivered. 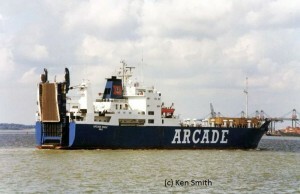 In August she was sold to DFDS, initially for use between Harwich-Esbjerg, entering service on 8th October 2002. In June 2003 she was replaced by her sister ship Dana Sirena. 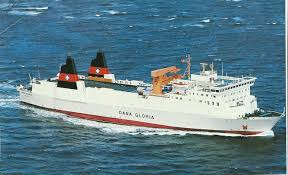 Dana Gloria was renamed Lisco Gloria for service on the Klaipeda-Kiel route. 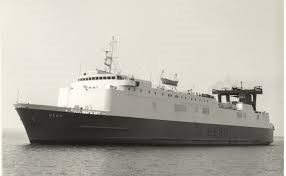 Dana Futura was built by the Helsingør Vaerft and entered service on the Harwich-Esbjerg run on the 16th January 1976, along with her Sister Dana Gloria they were the largest Ro/Ro Cargo Ferries to be built in Denmark at that time. 01/04/2011. Arrived Alang, India for scrapping. Freight Capacity. 2,025 Load Metres. History: Dana Optima (1979) Nopal Optima (1979-1983) Optima (1983). 10/1978: First arrival at Grimsby and naming ceremony. 06/1995: Lengthened by 35 m.
10/2001: Sold to Goliat Shipping, Oslo. Chartered for three years. 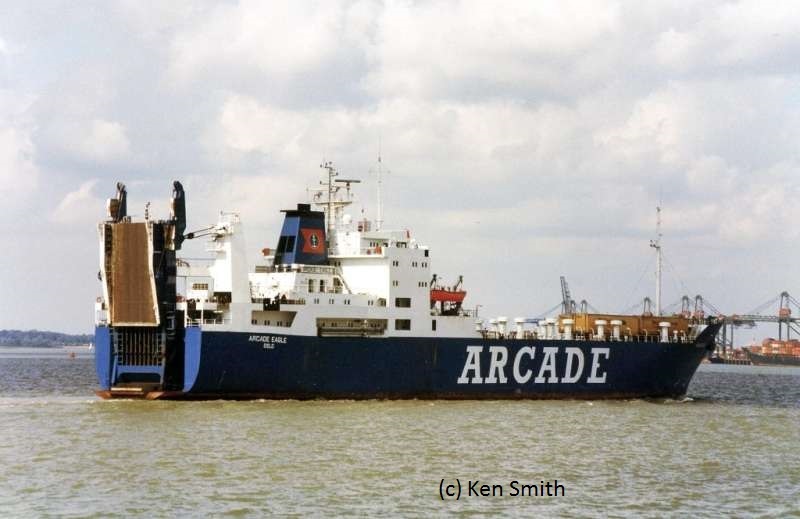 03/2008: Sold to P&O Ferries and renamed European Trader. 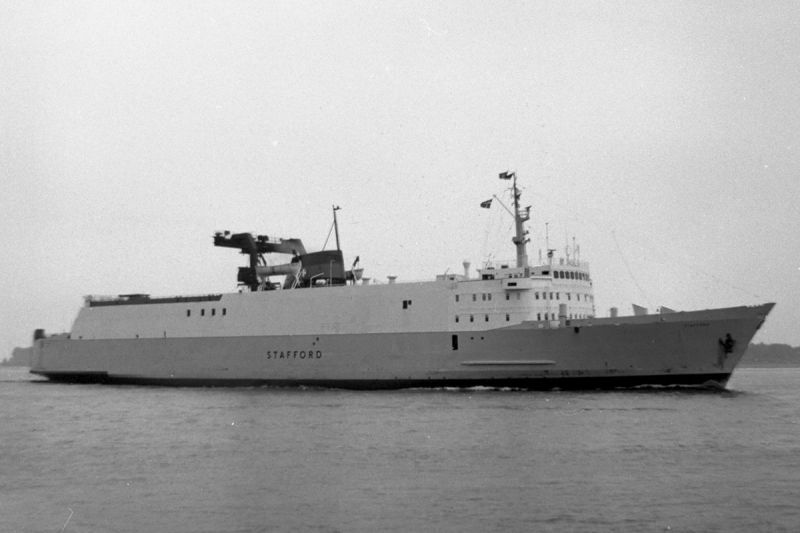 Dana Minerva was built in Denmark and was delivered to DFDS in 1979 at a cost of 51,675 million DKK. That same year the ship was sent to America to serve routes between the US Gulf, Central America, the Mediterranean and West Africa. 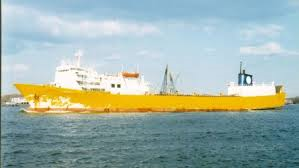 In the 1980s, the vessel was charted by Nopal Caribe Line and sailed between Miami, Aruba, Curaçao, La Guaira and other ports in the Caribbean. She was later sold to Kirk Line, where she sailed in the Far East. 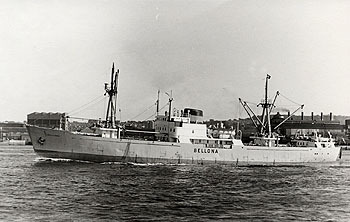 Renamed Challenger B in 1986, Dana Minerva left the Caribbean for the Pacific, where she sailed between Melbourne and Burnie, Tasmania for company Brambles. She has now been put on the market and is unfortunately likely to be sold for scrap. 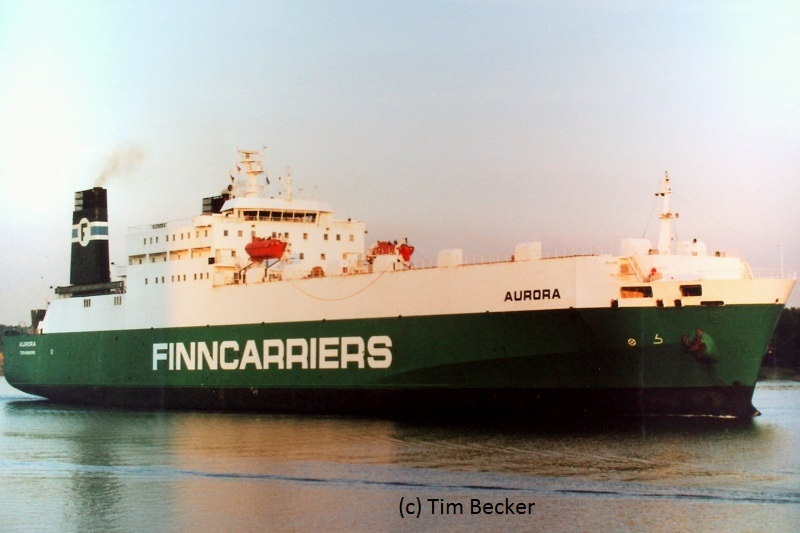 08/1998: Sold to DFDS A/S, Copenhagen. renamed Dana Minerva. 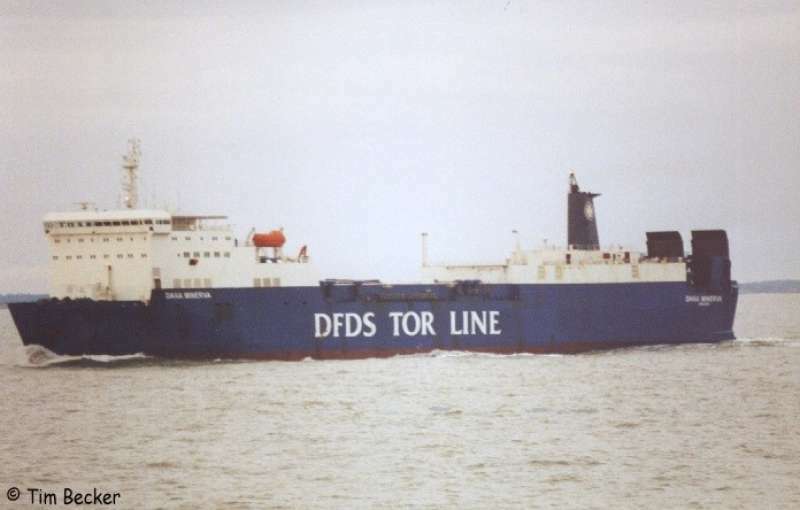 03/01/2001: Registered for DFDS Tor Line. renamed Tor Minerva. 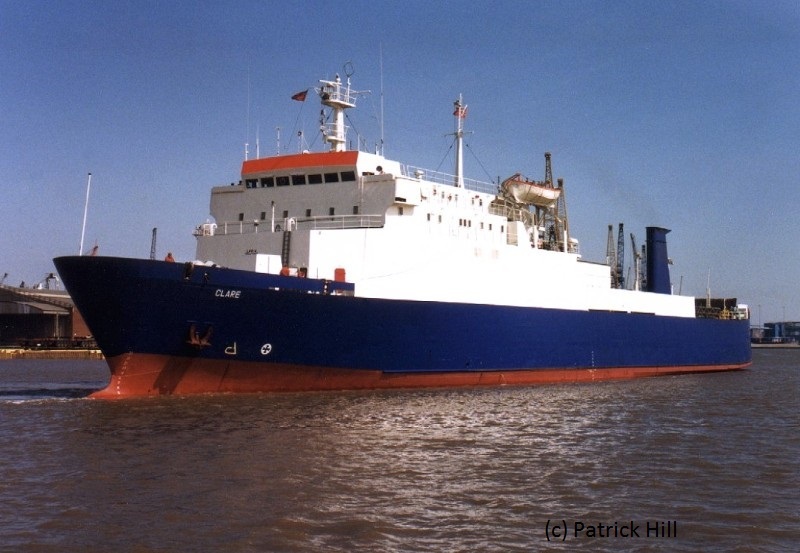 19/04/2003: Sold Goliat Shipping, Oslo. chartered by DFDS Tor Line. 02/2006: Chartered to Mann Lines. 06/2010: Sold to unknown shipping company. renamed Minerva. 06/2010: Sold to Indian breakers. 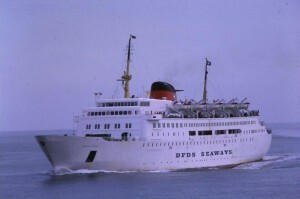 Dana Regina was delivered to DFDS in 1974 for the Harwich-Esbjerg route, on which she remained until 1983. 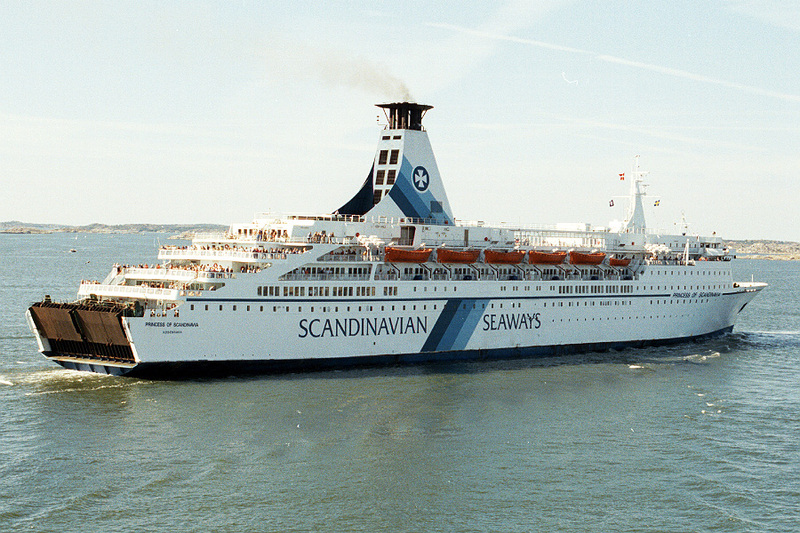 In 1990 Dana Regina was sold to Nordstrom & Thulin of Sweden for their Stockholm-Tallinn service marketed as EstLine. 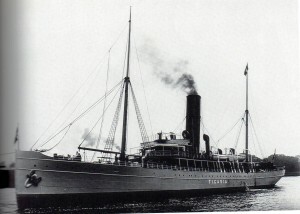 She was renamed Nord Estonia, and the official EstLine postcard is shown below. 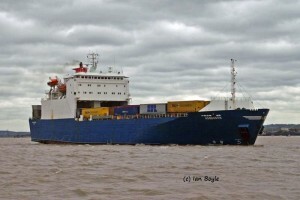 In 1992 she was chartered to Larvik Line as Thor Heyerdahl. 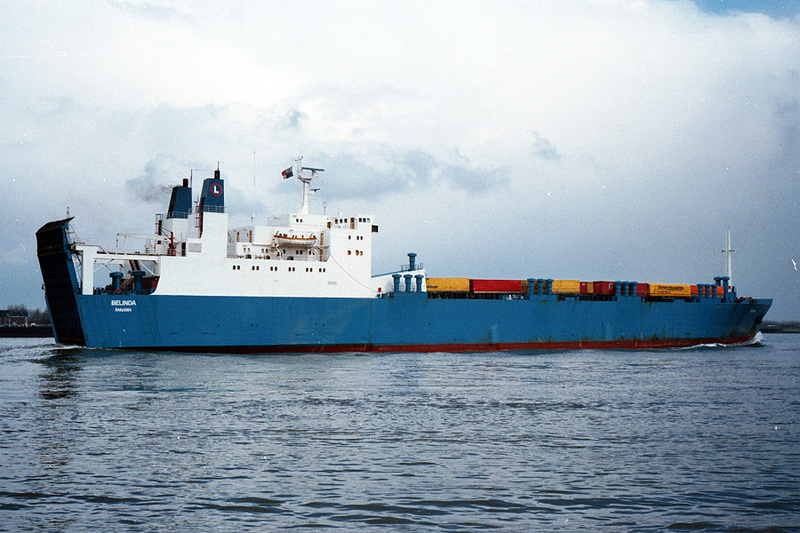 Between 1994-6 she operated as Vana Tallinn under charter to Tallink. 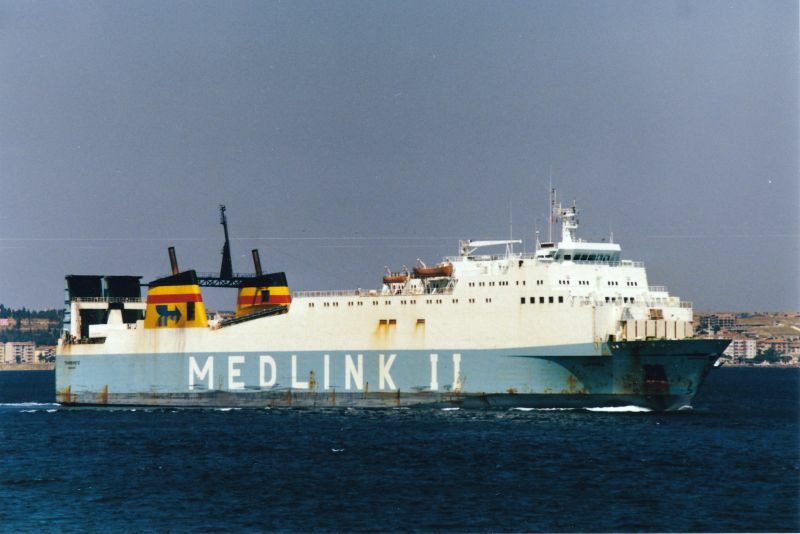 In 1998 she was purchased by Tallink. 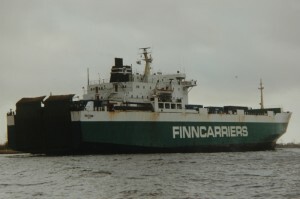 October 2008, she was reactivated as a freighter for the Paldiski–Kapellskär service the freighter service was short however and the ship was laid up again in Estonian Kopli in April 2009. She was subsequently leased to all ferries in June 2011 for a 3-year contract in the Mediterranean and got name Adriatica Queen. Sank by German air attack 9 June 1941 180 miles NW of the Faroes. 23.11.1965 Sold without change of name. 14.05.1968: On voyage Setubal – Venice a fire broke out near Punta Stilo. 15.05.1968: Refloated and towed to Messina. 17.05.1968: Arrived at Messina still on fire. 10.02.1969: Sank while lying at Messina. 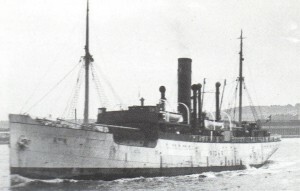 Dronning Maud transferred to the Harwich – Esbjerg route in the 1920s, she served for a while as a German troop ship in World War 2 before returning to the North Sea. Sold to Finland in 1947 until broken up in 1967 at the age of 61. 6/11/2005: Last sailing from Harwich to Cuxhaven. 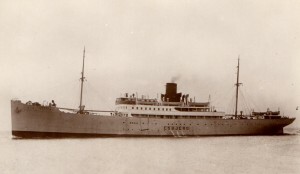 England was built in 1932 and was also deployed on the Harwich-Esbjerg route on 23 April 1932 where she sailed to September 1939. England had accommodation for 108 1st class and 82 3rd class passengers. The need for more care space plus the growth in traffic on the route led to the design and construction of the 10,000-ton England which was completed in 1964. With drive-on/drive-off facilities for 100 cars and much greater passenger capacity, England created something of a revolution on the route. After trials in Denmark, England arrived at Parkeston Quay on the 31st May 1964 and remained alongside for a few days for inspection by invited guests, and in order to try out specially designed car-ramps, which will equalise tidal variations and enable the motorist-passenger to drive his car on and off the ship. 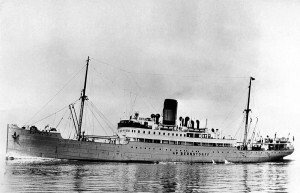 England was switched to the Newcastle –Faroe service after the arrival of Dana Regina in 1974. 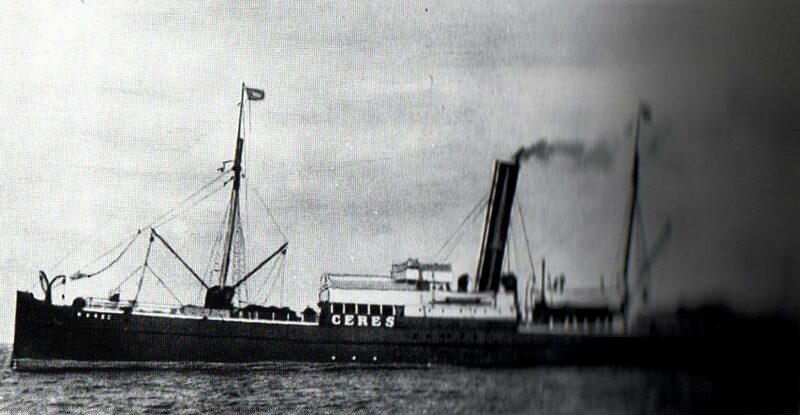 27/2/1918 on voyage to Copenhagen with coal, 26 men lost. 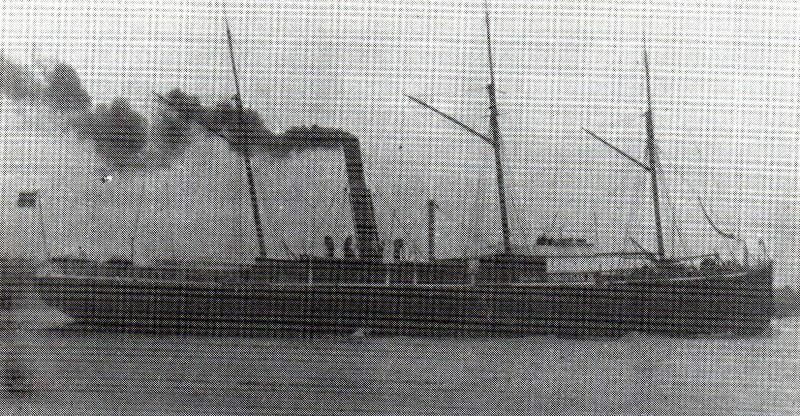 Esbern Snare was the second DFDS vessel to arrive at Harwich and inaugurated the Newcastle service in 1876. 12.09.1928: Renamed Esbern Snare (II). 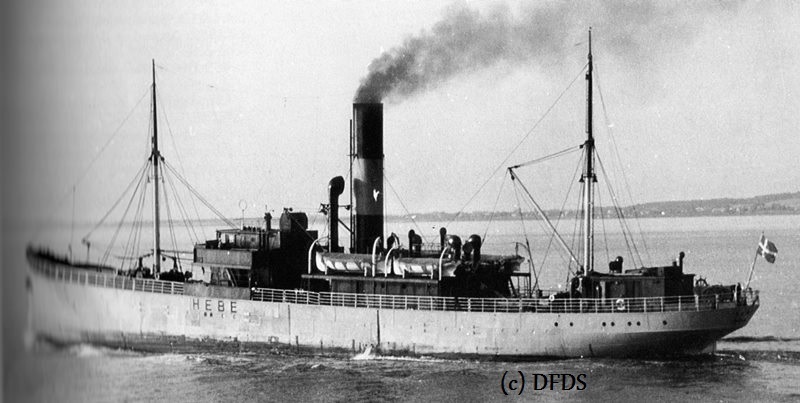 14.02.1930: Hamburg – Aalborg damaged after collision with S/S Carl on the river Elbe and sank off Altona. raised by Bugsier Reederei und Bergungs AG. 04.03.1930: Sold to Leith & Co. Hamburg for demolition. Seized by the German navy in 1944, Esbjerg was renamed Kurassier and taken for target ship duties before returning to Denmark in 1945. After spells in Spain the ship was sold for scrap in 1978. 25.01.1891: Pressed aground at Fanø by ice. 27/07/1897 Sold to Chargeurs Algeriens Réunis renamed Rhone ET Saone. 1914 Sold to Soc. Les Affréteurs Réunis, Alger. 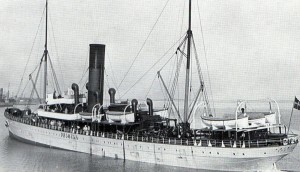 02/01/1915 Voyage Bordeaux – Lisbon grounded and wrecked off La Rochelle. 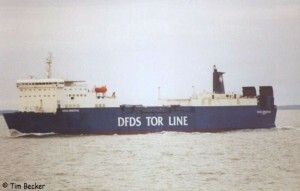 08/1992 Chartered to DFDS a/s, Copenhagen. 20/08/2001 Arrived in Alang for breaking. 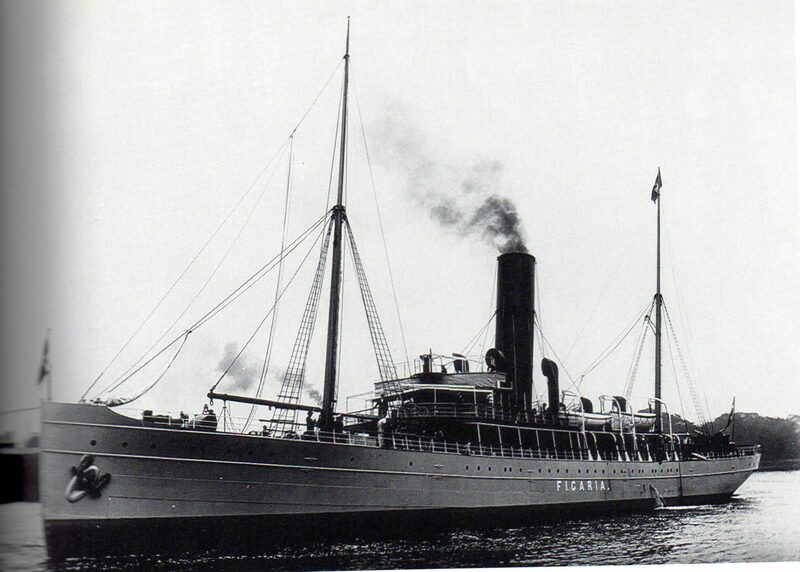 Ficaria was sold to Hughes Bolckow for scrapping at Blyth in 1934. 28/04/1972: Sold to Sweet Lines Inc. renamed Sweet Lord. 19/04/1972: Converted into a passenger and cargo motor ship. 16/04/1979: Grounded near Romblon during a typhoon. 05/07/1981: Stranded off Sepoc Point, Maricaban Island. declared a total loss. 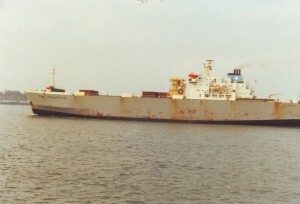 Sailed between Parkeston Quay and Hamburg 1983, launched as Tor Caledonia, arrived Alang, India 19 May 2012 for scrapping. 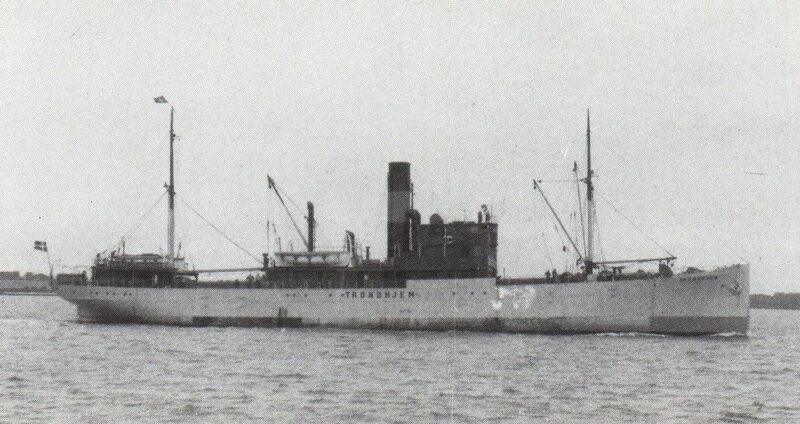 02/08/1942 Torpedoed by U-254 South of Iceland while on voyage from Reykjavik to Hull. 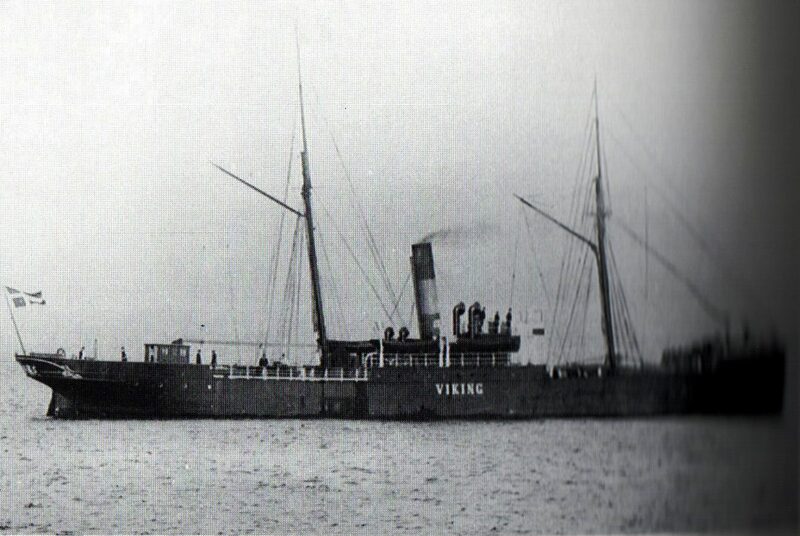 1900 Purchased from Jydske ss Co, Aarhus. 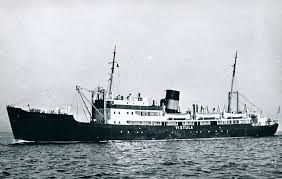 27/11/1950 Struck a Mine and sank, all crew saved. Broken Up at Dortmund March 1924. 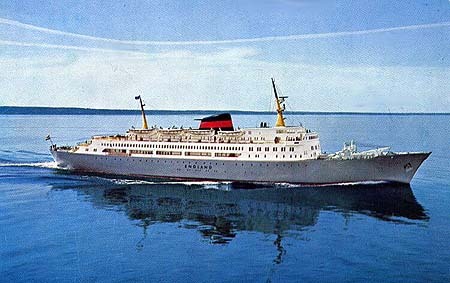 Kronprins Harald was built in 1976 by Werft Nobiskrug, Rendsburg, for the Jahre Line Kiel-Oslo service. 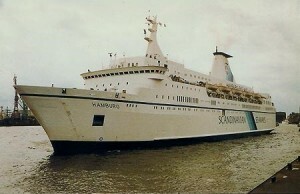 In 1987 she was sold to DFDS, and was renamed Hamburg, and entered service on the Harwich-Hamburg route. In 1997 she was renamed Admiral of Scandinavia and changed service to Ijmuiden-Newcastle-Hamburg. She continued on services out of Newcastle until 2002 when she transferred to the Harwich-Cuxhaven route until November 2002. In 2003 she entered service between Puerto Rico-Santo Domingo as the Caribbean Express and was eventually scrapped in India on the 25th January 2011. M.v. Hero was lost in very heavy weather on voyage between Esbjerg and Grimsby and abandoned on 12/11/1977, she sank the next day. 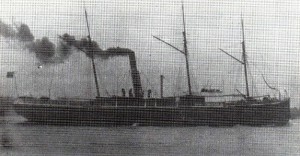 1901 saw the introduction onto the service in Harwich of the “J.C. 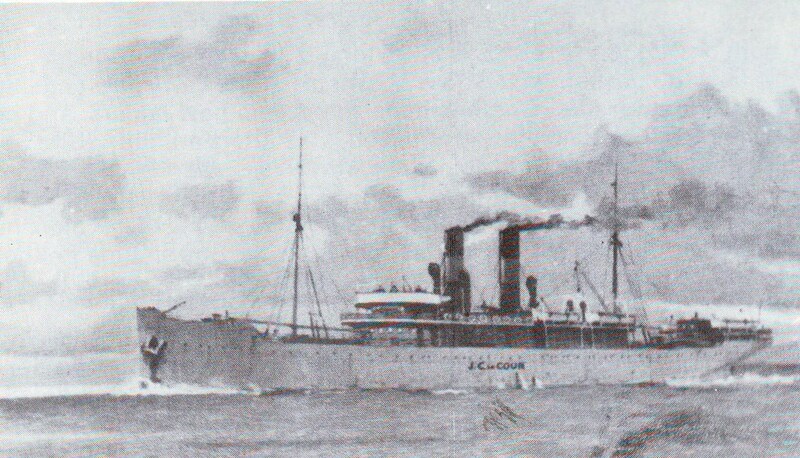 la Coir” built in the Elsinore Shipyard she was 1,635 tons and had a speed of 15 knots – which was fast time for a liner of her time. She was in service on the North Sea until1 1929, J.C. la Cour could accommodate 112 passengers in two classes and was able to offer three sailings a week in each direction. 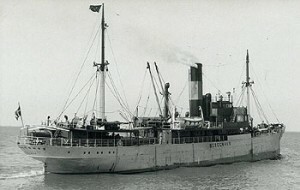 The final call at Harwich was in 1931 before being laid up in Esbjerg and sold for scrap in 1933 to Blyth Shipbreakers. 19/01/1944: Seized by the Germans. 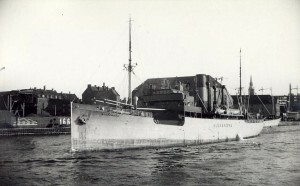 03/05/1945: Bombed in an Allied air attack off Travemünde sank while towed by the tug Wogram. 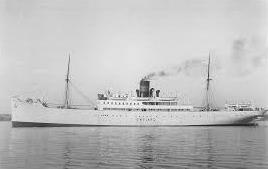 05/03/1926: Sold to Hans Petersen, renamed Prins Hamlet. 02/02/1935: Sold to Henry Andersen, Copenhagen. Beached and abandoned 2 April 1982 off Gythion, Greece. Scrapped July 1983. 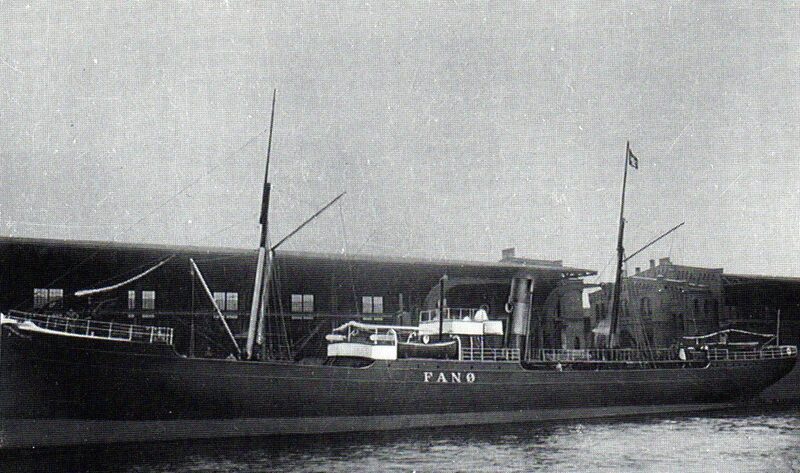 05/1/1903 On voyage Harwich – Esbjerg with passengers and general cargo, stranded on the SW coast of Fanø. Passengers and crew saved by the lifeboat from Sønderho. 02/8/1906 Sold to Petersen & Albeck for demolition. 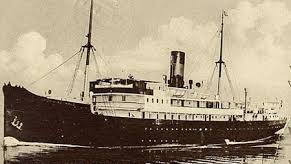 19/9/1921: Arrived at Kiel and rebuilt by Deutsche Werke. 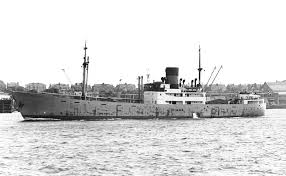 29/08/1938: Arrived at Copenhagen from Frederikshavn and laid up. 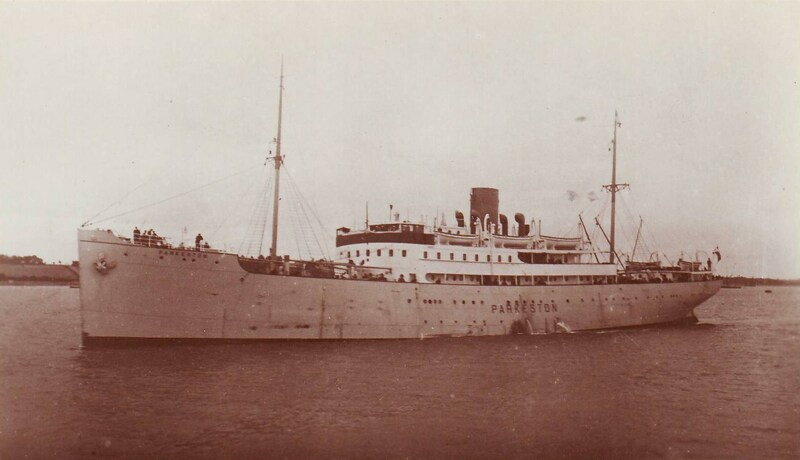 27/09/1938: Sold to Pärnu Laeva A/S, Pärnu. 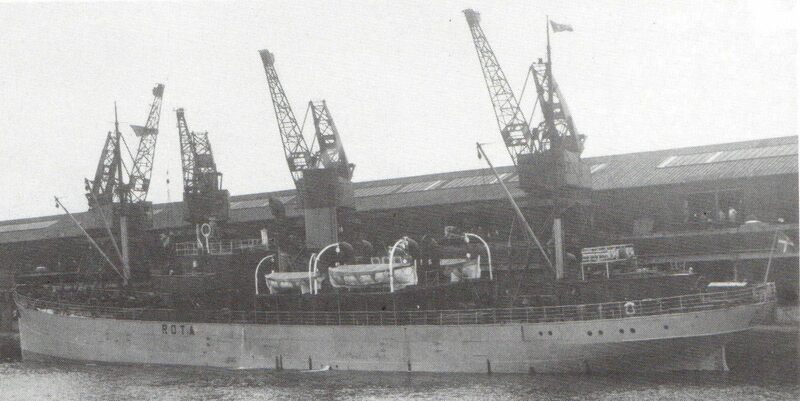 28/09/1938: Taken over by her new owners and renamed Vironia. 4/1940: Captured by the Russian Navy in an Estonian port. 28/08/1941: Struck a mine and sank off Kap Juminda. 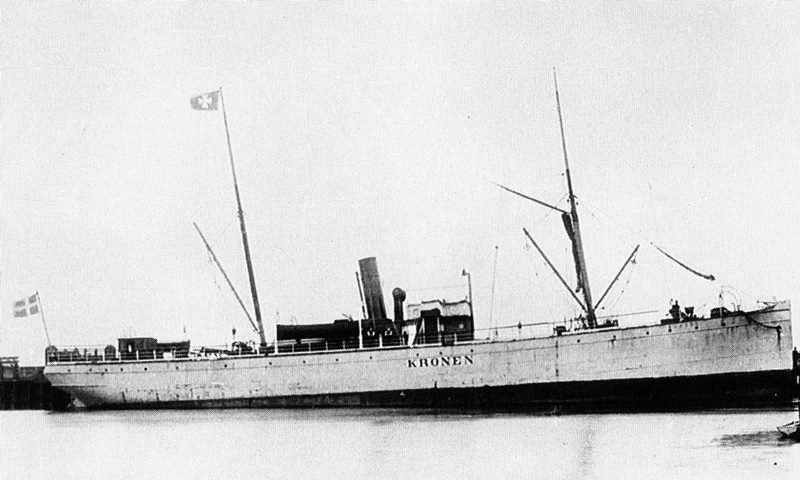 Kronen sank on the 4/10/1899 off Tyne Pier, Newcastle following a collision with the Blytheville. 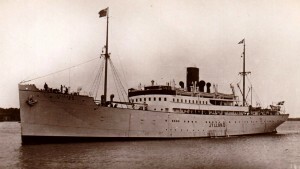 The ship was completed on 25 May 1941, towed to Copenhagen on 06 June 1941 and delivered to the owners on 19 June. Propulsion was provided by twin B&W 1050-VF-90 Diesel Engines (5294 kW) and twin propellers which gave the ship a cruising speed of 20.5 knots. 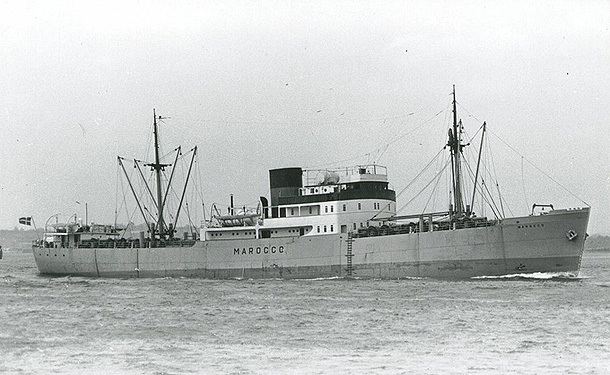 On 19th April 1953, the ship arrived at Harwich after making passage from Esbjerg, Denmark and moored at Parkeston Quay. Soon after the passengers had disembarked a fire broke out in one of the passenger cabins. Firefighting efforts by the ship’s crew were unable to control the fire. Local firefighting brigades arrived and provided additional assistance, however, the fire continued to rage out of control. 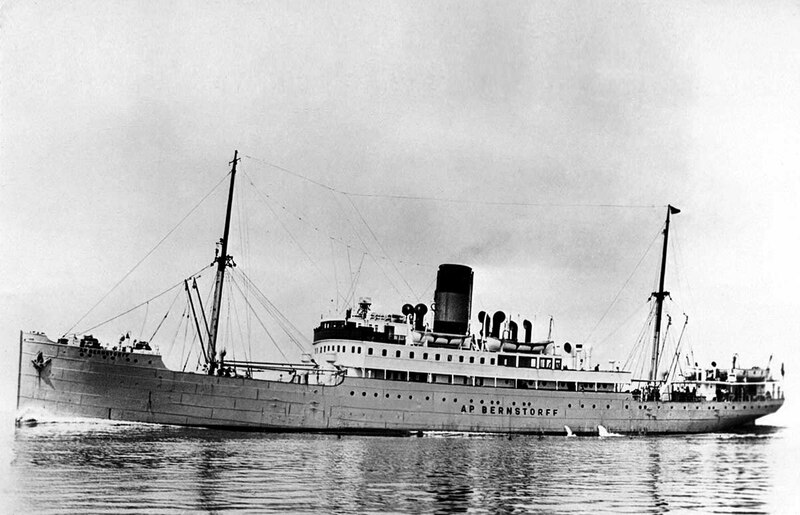 Kronprins Frederik was returned to service on the Esbjerg-Harwich route where the ship provided reliable service until 1963 when the ship was leased out for private charter to the Carlsberg Distribution Co Ltd, London, England for a passage departing from Harwich on 22nd May 1963 and sailing to Oslo, Norway, then on to Copenhagen, Denmark, returning to Harwich on 29th May. 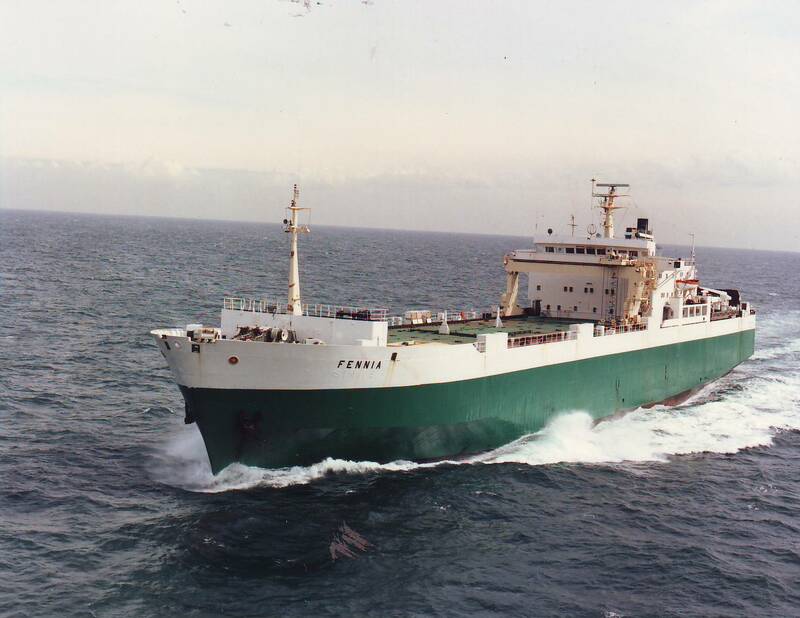 On 10th March 1976, the Kronprins Frederik was purchased by the Arab Navigation Company, Suez, Egypt, taking possession of the ship on 16th March and was renamed as the M/V Patra. On 24th December 1976, the Patra departed Jeddah, Saudi Arabia on passage to Suez, Egypt with 353-387 passengers and 88-94 crew on board, The Patra, still in flames, sank a few hours later on the early morning of 25th December 1976 in over 450 meters of water. 102 lives were lost. In bright sunlight and before many distinguished guests, including King Frederick and Queen Ingrid of Denmark and some thousands of cheering shipyard workers, Kronprinsessa Ingrid, was launched by seven-year-old Princess Margrethe, eldest daughter of the King and Queen, at Elsinore, Denmark. The young princess’s part in the ceremony was unexpected and it was a surprise that added a further touch of splendour to the memorable occasion. 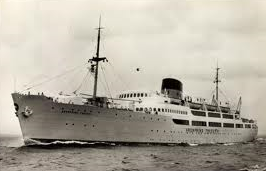 Kronprinsesse Ingrid maintained the post war Harwich service and was replaced by the Winston Churchill in 1966. 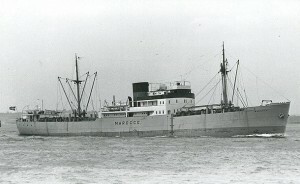 She was eventually sold to Greece and broken up in Pakistan in 1985. Kursk was lost with all hands off Vlissingen on the 26th August 1912. 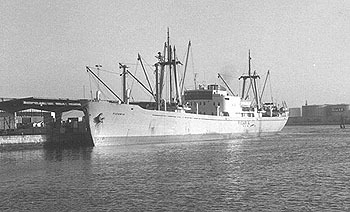 1968 Renamed Beiteddine, The ship caught fire off Bejaia on the 5.9.1973 and was beached the ship was carrying explosives & general cargo. 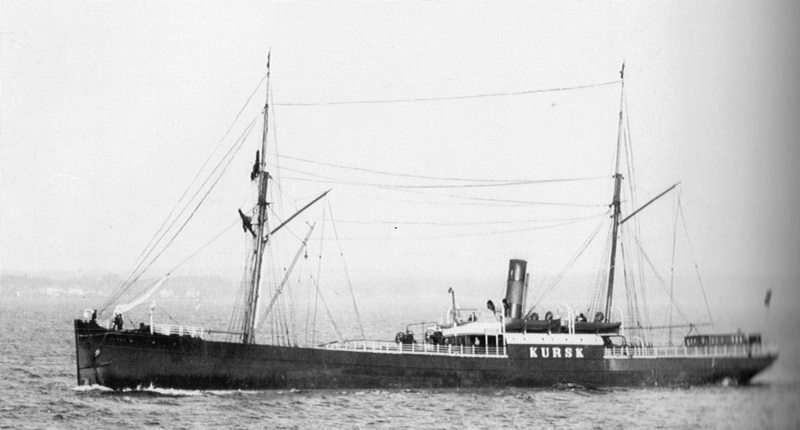 On the 1st September 1909 on voyage from Blyth – Korsor the Iron cargo ship capsized and sank with a cargo of General cargo & coal during heavy weather. All hands were saved. 27/04/1940: Laid up until the end of the war. 1971: Sold and renamed Dimitram. 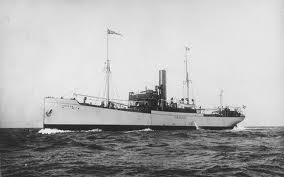 On voyage Blyth – Odense on the 5th April 1917 N.J. Fjord was captured and sunk by a German submarine in the North Sea about 40 miles from Farne Islands. All hands saved by the lifeboats. Eventually they were picked up by British trawlers and patrol boats. After a lengthy search, a team of divers have made a sensational discovery. 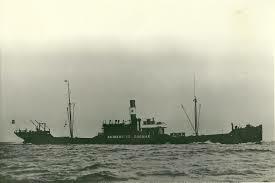 In water 70 metres deep off the east coast of England, on 19 June they found the wreck of NJ Fjord. NJ Fjord is not just any old ship. 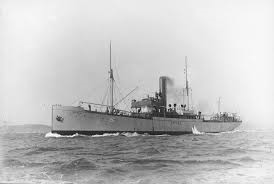 In 1917, during the First World War, it was inspected by the English warship Elbing as it was heading eastwards off the coast of Denmark. Since a fair amount of steam was being released, it was also seen by the nearby German warship Galatea, which immediately sailed there, and fire was opened. It was the first gun shots in the battle that became known as the Battle of Jutland. NJ Fjord thus became the accidental trigger for one of history’s biggest and fiercest battles with huge loss of life on both sides. NJ Fjord hurried away, but later that year while sailing to England it encountered a German warship, which fortunately allowed the crew to disembark from the ship before they attached explosives to the side of the ship and sank it. Freight Capacity. 1847 Load Metres. 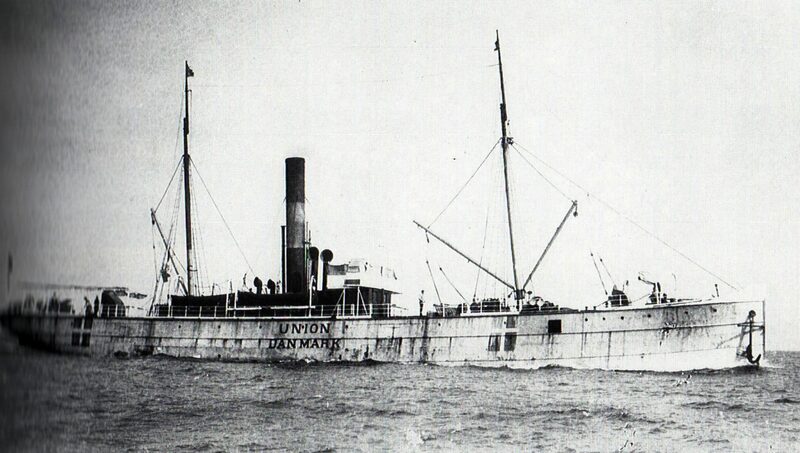 1983 Chartered to Union Steamship Co, Renamed Union Sydney. 1988 Registered to Helios Investment. Renamed Pacific Prosperity. 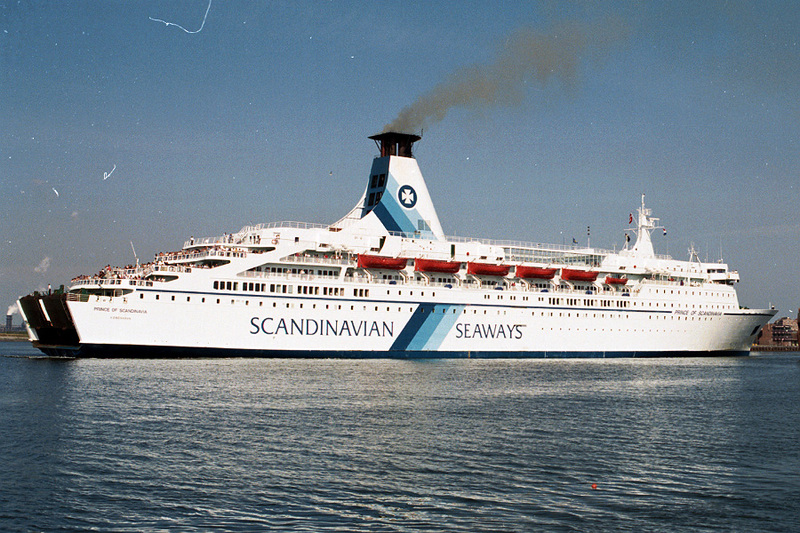 1997 Chartered to DFDS a/s, Copenhagen. Esbjerg-Harwich. 1998 Sold to International Maritime Corp, Renamed Azzahira. 2007 Sold to Pontos Shipping Ltd, Cyprus. Renamed Pontus. 2011 Sold to Turkey. Renamed Pon. 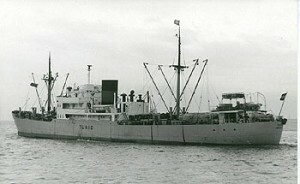 After use as accommodation vessel in Oslo she was broken up in 1975. 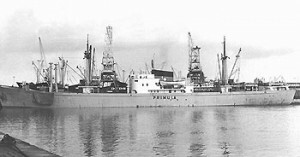 Primula was sold to Clayton & Davie Ltd for scrapping at Dunston-on-Tyne in February 1938. 1972 Sold to Philippines, renamed Sweet Love. Tor Britannia was built in 1974 for the Gothenburg-Amsterdam and Gothenburg-Felixstowe services of Tor Line. from 1983 Tor Britannia operated some services between Harwich and Esbjerg, which was achieved much faster than running-partner Dana Anglia due to Tor Britannia’s higher speed. 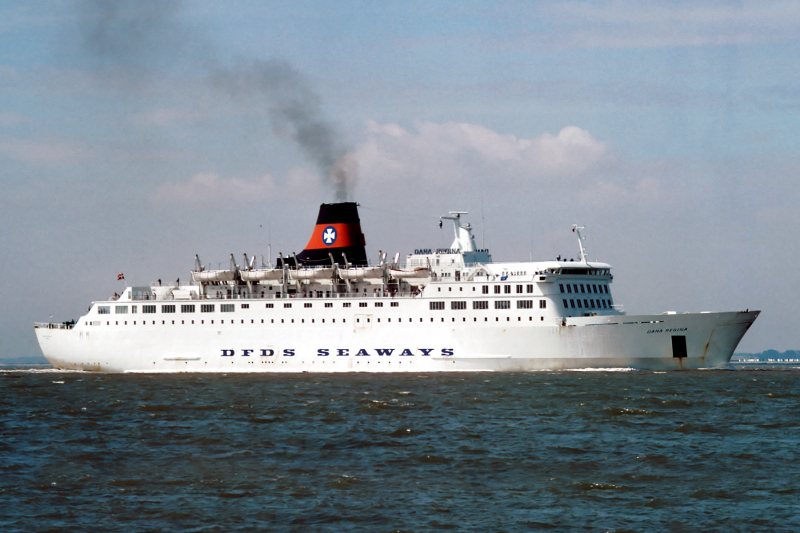 She later served on most other DFDS Seaways routes, including Harwich-Hamburg, and routes from Ijmuiden to Norway and Sweden. 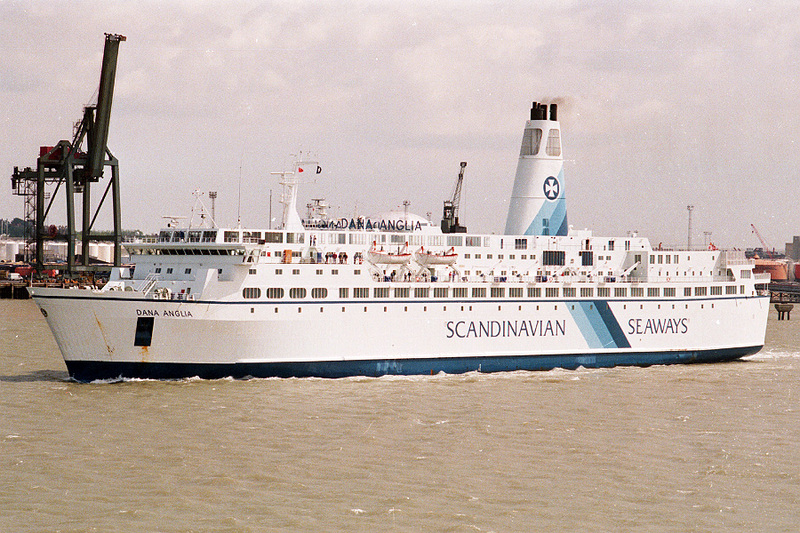 In 1991 Tor Britannia was renamed Prince of Scandinavia. 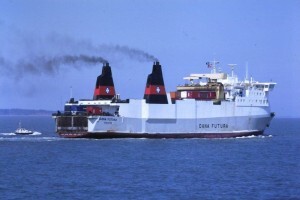 In 2003, Prince of Scandinavia was sold to Moby Lines and entered service as the Moby Drea between Livorno and Olbia. Tor Scandinavia was eventually delivered on April 12, 1976. Although technically modern in many ways; the ships’ exteriors were quite traditional in their style, reminiscent more of ocean liners than ferries. 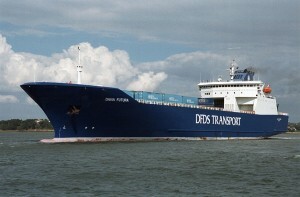 For all of its service with Tor Line, the Tor Scandinavia alternated with its sister on the routes Gothenburg–Immingham and later Felixstowe) and Gothenburg–Amsterdam. Already in autumn 1976 the ship had her first major accident, when she ran into a major storm on the North Sea. Nine windows were smashed and the ship started taking in water from the forward air intakes on the superstructure. 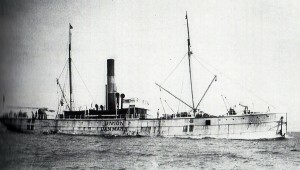 Eventually the ship arrived in Amsterdam approximately 18 hours behind schedule. 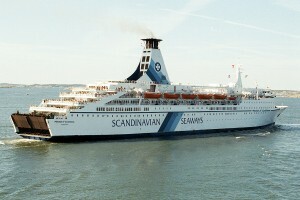 Tor Scandinavia was renamed Princess of Scandinavia in 1991 and was sold to Moby lines in 2006 and renamed Moby Otta. Prinz Hamlet was built in 1973 at Rendsburg for Prinz Ferries and used on their Harwich-Hamburg service. 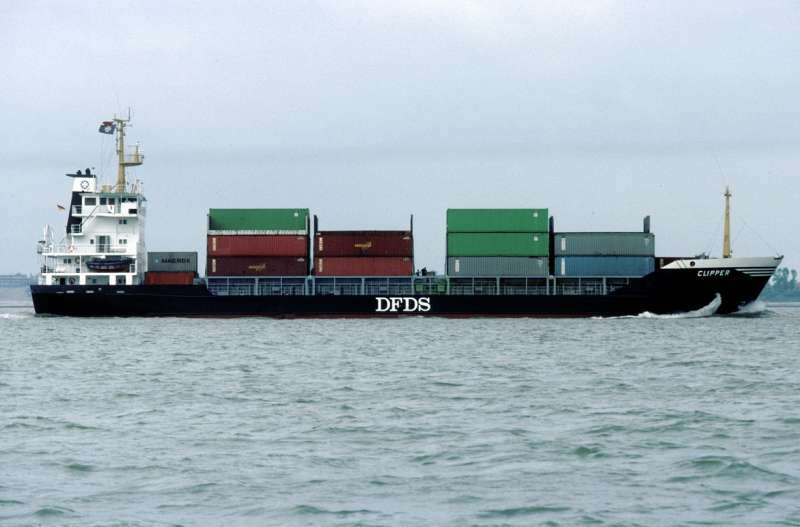 From 1981 this service passed to DFDS, who chartered the Prinz Hamlet followed by purchase in May 1987 when she was renamed Prins Hamlet. 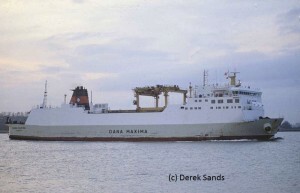 She ran on various DFDS services, mainly from Newcastle, until sale to Stena Line in September 1988. Stena briefly renamed her Stena Baltica before a charter to Polferries (Polska Zegluga Baltyska) as Nieborow. In 2002 she passed to Montenegro Lines for services to Italy as Sveti Stefan II. 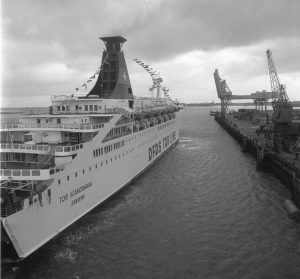 Prins Oberon was built in 1970 by Werft Nobiskrug, Rendsburg for Lion Ferry. She entered service for Prinzen Linien between Bremerhaven-Harwich. In 1978 she was sold to German owners and the name was revised to Prinz Oberon. 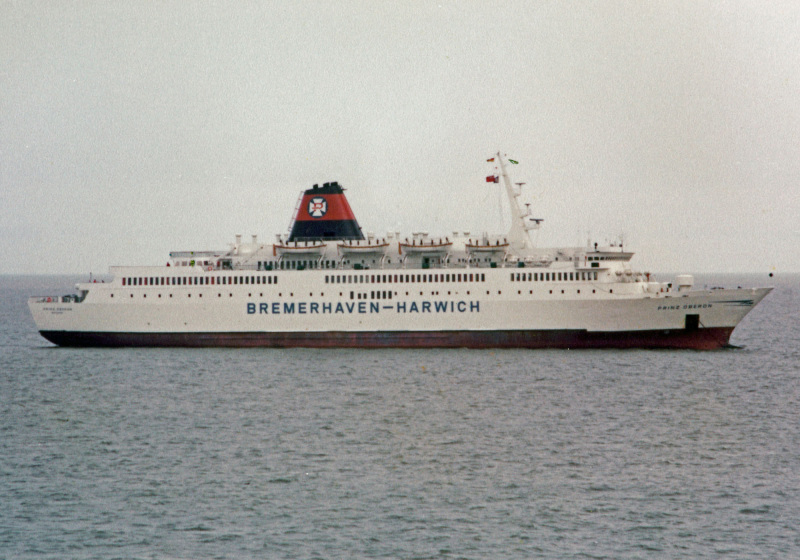 In 1981, the line was acquired by DFDS, and the Harwich-Bremerhaven rote was closed at the end of 1982. 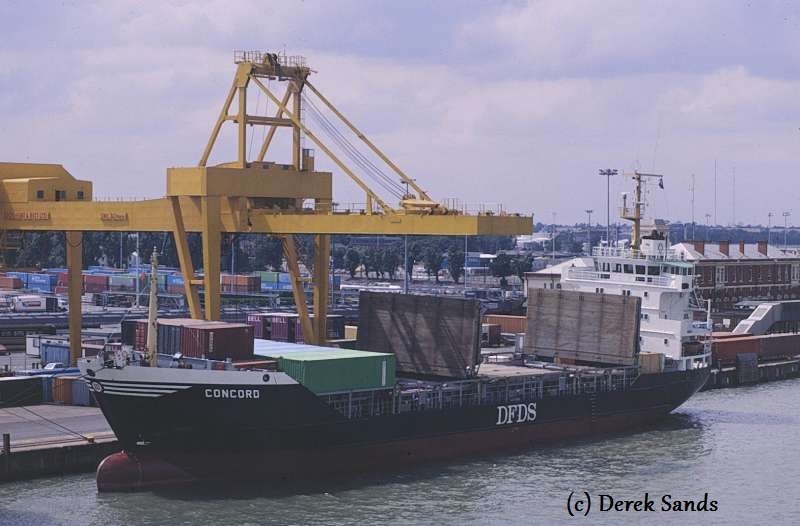 Following charters to SMZ and Sealink, Prins Oberon was laid up, returning for brief periods on DFDS services Esbjerg-Newcastle-Göteborg and a new Cuxhaven-Harwich-Göteborg route in 1984. Following further charters, she was sold for Malaysian services as Cruise Muhibah. From 1990-93 she was chartered to B&I Line as Munster between Rosslare-Pembroke Dock. Various Mediterranean charters followed as Ambassador and Ambassador II. 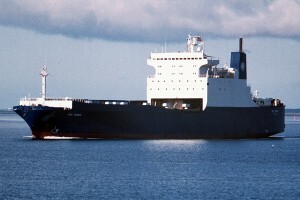 In 1997 she was rebuilt for short casino cruises from Florida, still named Ambassador II. 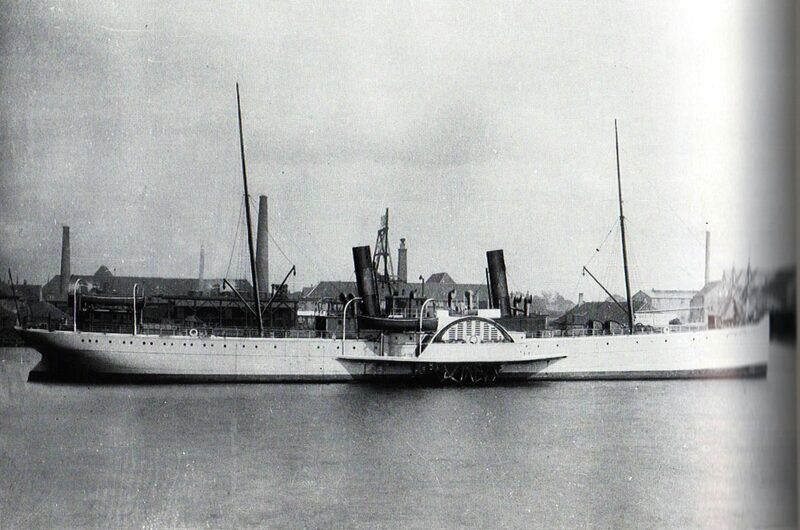 The Paddle steamer Riberhuus made the first crossing between Esbjerg and Harwich on the 4th June 1880. 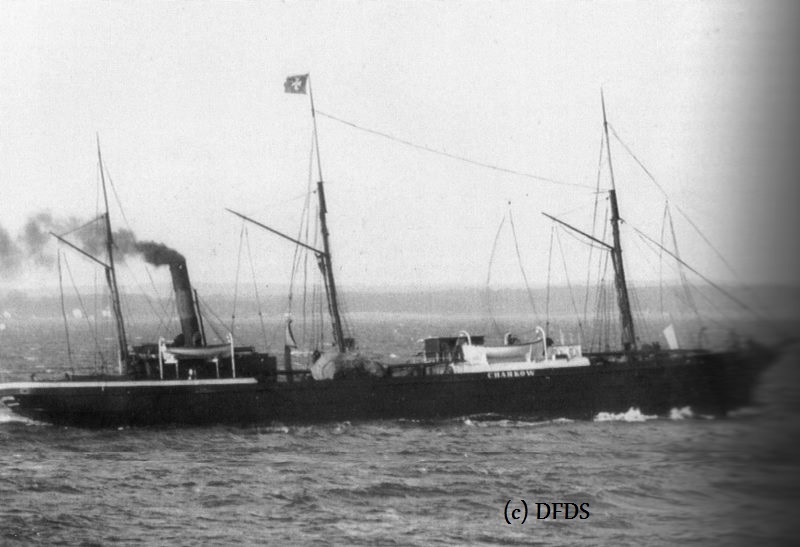 Built in 1875 she was the first vessel alongside Parkeston Quay on Friday September 22nd 1882, she arrived with a cargo of 1,324 sheep,1 calf, 190 oxen, 237 casks of butter, 30 cases of eggs and 58 barrels of bacon. 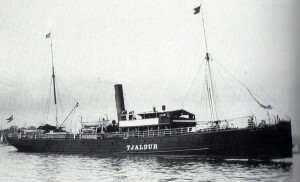 Passengers took second place in those days and often found themselves amongst cattle in the hold. 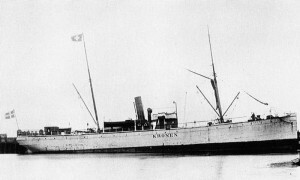 She remained in the company’s service until 1918. 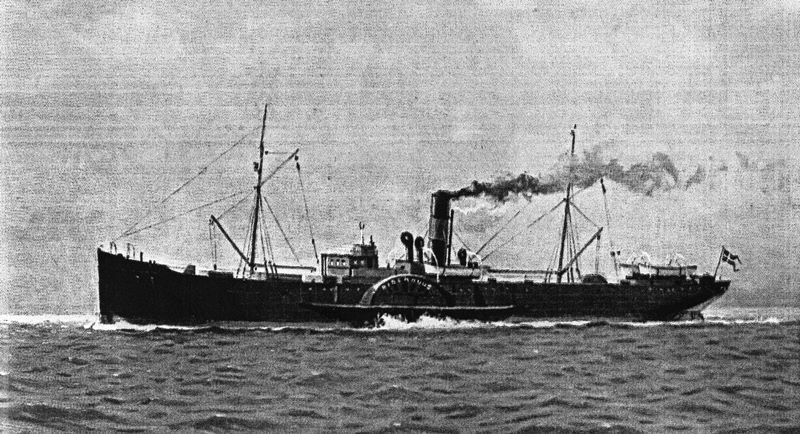 02/06/1880: Left Esbjerg with Esbjern Snare in the new Esbjerg-Harwich service. 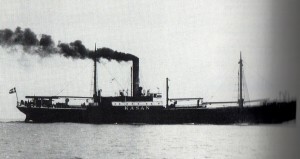 22/09/1882: Arrived Parkeston Quay with first cargo of cattle. 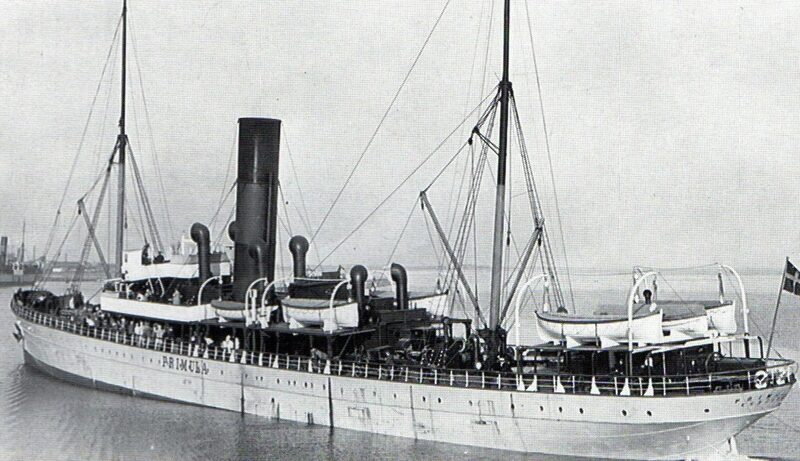 01/11/1920: Sank after collision with ss Westwood at St. Nazaire. 03/02/1962 Laid up at Copenhagen. 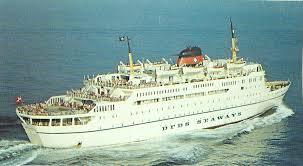 09/1985 Chartered to DFDS Hamburg-Harwich. 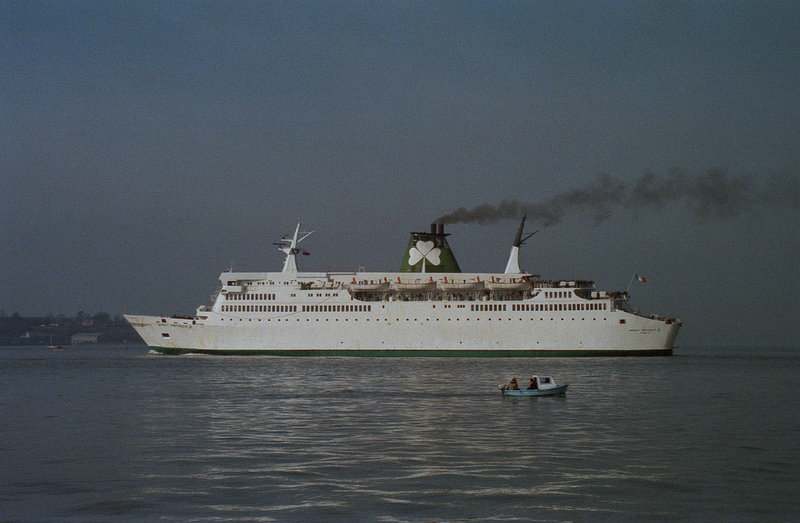 Saint Patrick II (1982-1998) Aurella (1973-1982). History: Weston (1985) Rijnhaven (1995) Seatern (1998) Kunda (2000) Seatern (2002) Seaterns (2003). On 22 June 2013, Sirena Seaways collided with the dockside at Harwich, Essex, with 489 passengers on board. 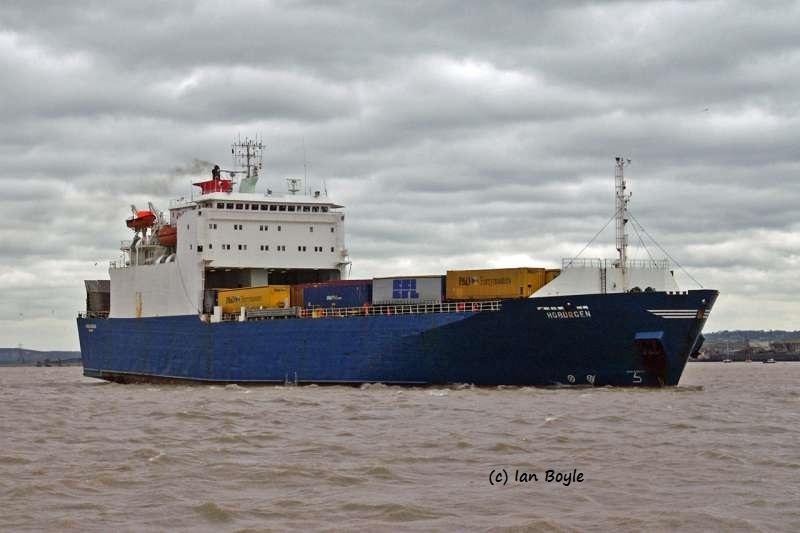 The incident caused some damage to the dockside, loading ramp and ship, resulting in the vessel taking on water. The crew blocked the opening from inside and the watertight compartments were used to prevent the ship from capisizing. The Harwich RNLI lifeboat, Walton Coastguard rescue team and an RAF search and rescue helicopter from Wattisham Airfield responded to the incident, along with a number of other vessels nearby. The ferry was brought alongside at 14:45 and the passengers were disembarked. 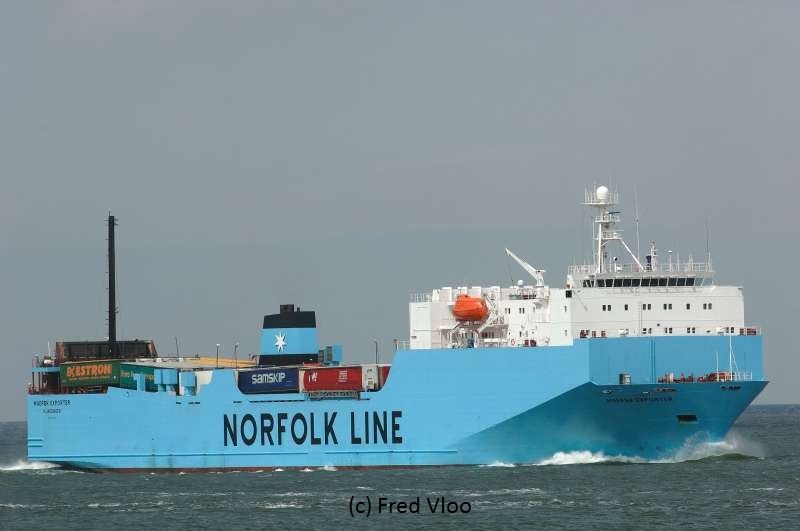 The last sailing from Harwich-Esbjerg was on September 29th 2014, Sirena Seaways, which has operated the route since 2003, will be deployed elsewhere. Purcell Livestock (1981) – Livestock (1982)- Fastock (1984)- Afroditi (1987) Zaher V (1995). 9th June 1967, M.V. Stafford arrived at the west portal for the first time, the new ship, of 2,602 tons, was a stern loading freight Ro-Ro ship with space on two cargo decks for 113 trailers. 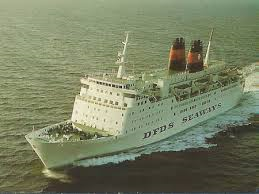 08/01/1985 Chartered to DFDS Esbjerg-Harwich. 23.04.1966: Left Trieste as Forenede from Copenhagen via Felixstowe. 13.05.1966: Left Copenhagen for Felixstowe. 1982: Sold to Najd Marine Corp. S.A., Jeddah. 28.12.1988: Laid up at Jeddah in a damaged condition. 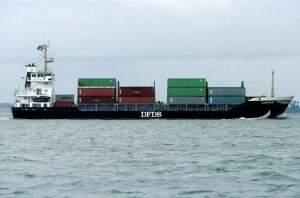 1985 Chartered to DFDS. Renamed Dana Germania. 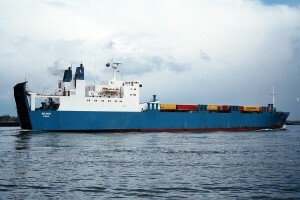 1989 Chartered to Elbe Humber Roline. 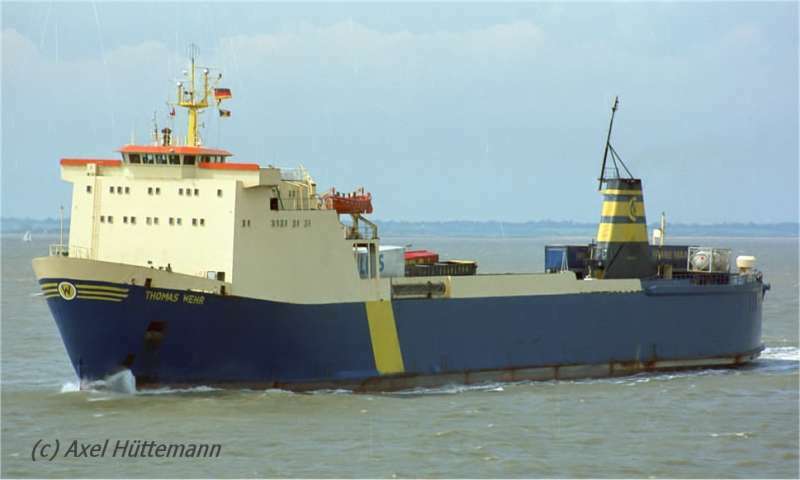 Cuxhaven – Bremerhaven-Immingham-Harwich. 06/08/1956: Arrived at Copenhagen from Grimsby and laid up. 08/02/1957: Sold to Eisen und Metall KG, Lehr & Co., Hamburg. 19/02/1957: Arrived at Bremerhaven for demolition. Launched as “Vega” in 1898, Sold to DFDS Copenhagen 1904 and renamed Tjaldur. 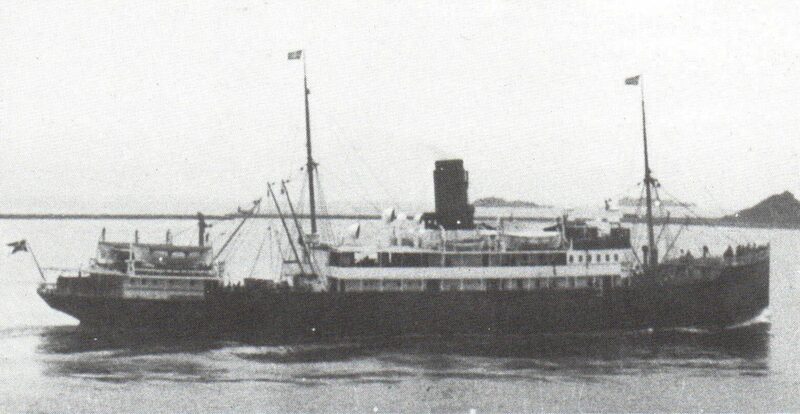 1939 Sold to Panama, renamed Dora. Yard. Metallurgique & Navale Dunkirk, France. 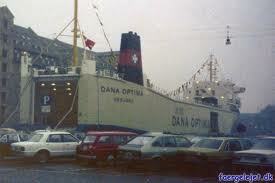 01/1989 – 27/11/1989 Renamed Dana Hafnia. 15/04/1993 Renamed Brit Dania (Britline) Esbjerg-Harwich. 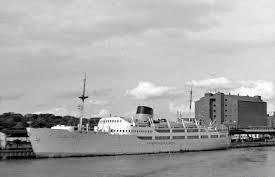 In service mainly Copenhagen to West Norway and Baltic, continuing 1940-1945, Accommodation reduced post-war. Mainly on UK services including Leith and the Humber from 1945, arrived at Bruges for breaking on 25/08/1963. 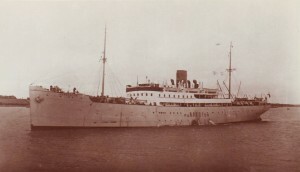 1941 Requisitioned by USA, renamed Aquila. 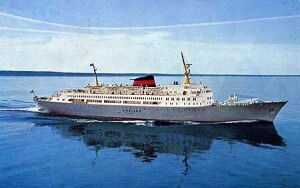 1966 Sold to Greece, renamed Maria T.
Launched in 1979 as the Scandinavia. She spent a large part of her career serving the Dover-Calais cross channel ferry route with successive operators. In March 2004, the new owners GA Ferries renamed the vessel to Alkmini A, operating a service between Igoumenitsa, Greece and Brindisi, Italy from June 2004, this however was not to last and in September 2004 the Alkmini A was sold to Polferries and transferred to the Baltic Sea as the Wawel operating a route from 15 February 2005 between Swinoujscie, Poland and Ystad, Sweden. 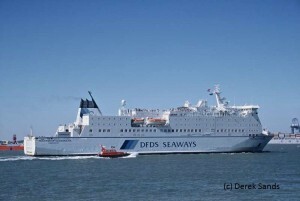 In October 2008 she was chartered to DFDS to continue this route. She is currently in service with Polferries as the Wawel. Yard. Lobnitz Coulborn & Co.
31/01/1940: Grimsby – Esbjerg, torpedoed by the German submarine U-21 in the North Sea and sank the following day. 15 men were lost. 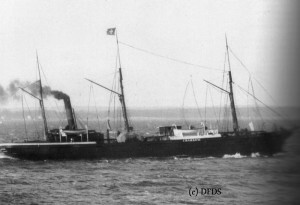 18/03/1891 Sold to DFDS Copenhagen. 1891 Purchased from Grandchamp, Dieppe and renamed Viking. 1917 shelled and sunk by German submarine in Bay of Biscay. 2004 Arrived Aliaga, Turkey for breaking up. The Winston Churchill was ordered in 1965 and built in Italy to meet the needs of increasing passenger and car traffic between Harwich and Esbjerg. Accommodation for up to 462 passengers and 180 cars, and was also able to accommodate coaches, caravans, Lorries and trailers. 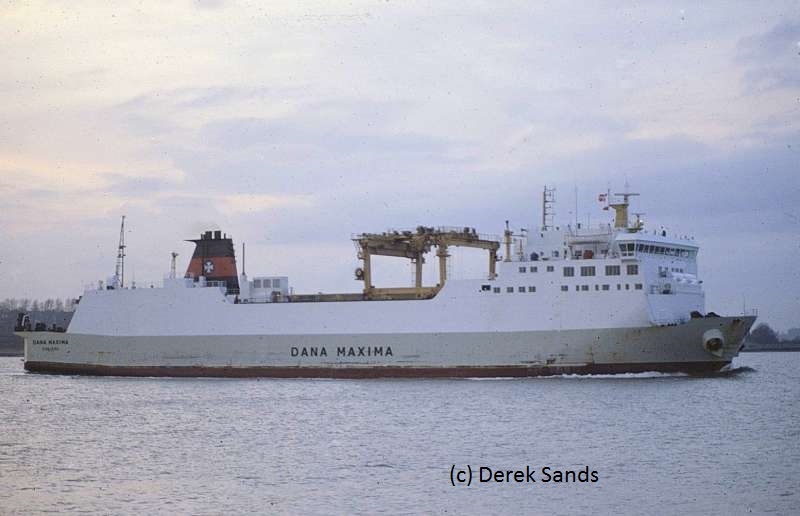 As demand for vehicle-carrying services grew, larger vessels were required for the route and the Winston Churchill was transferred to the River Tyne in 1978, for the twice-weekly service to Gothenburg, following the arrival of the new DFDS vessel MS Dana Anglia on the Harwich route. 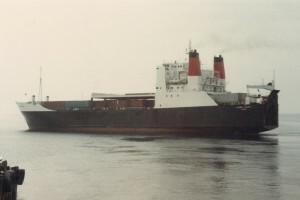 She was eventually replaced on the Esbjerg route out of the Tyne by a new vessel, the MS King of Scandinavia. 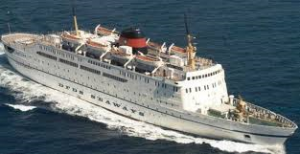 She was badly damaged by a fire in her alternator room during a refit at Esbjerg in April 1996, and she was subsequently repaired and sold to Empress Cruise Lines, becoming the Mayan Empress. She was eventually sold for scrap in India in 2004. The route between Harwich and Esbjerg in Denmark, has been in operation for nearly 140 years. The Last sailing Sunday 28th September 2014 . 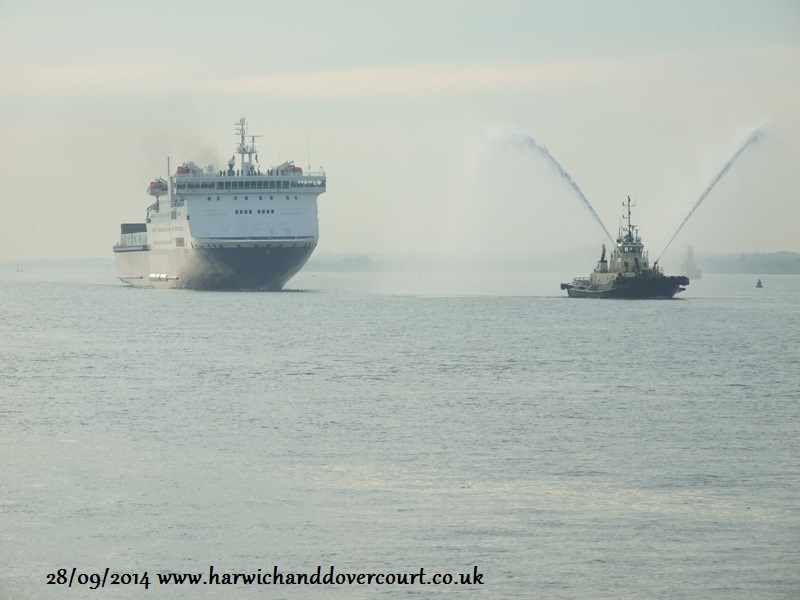 “A Sad Day” at 1715 hours Sunday 28th September 2014 Sirena Seaways left her berth at Parkeston Quay for the last time. it was a warm sunny evening on the packed Ha’penny Pier in Harwich, as the ferry approached the waiting crowds with a water tug leading the way there was a silence, the bridge of the ship was packed with the ship’s crew all waving goodbye for the last time as well as the passengers on the upper deck, the horn sounded twice and you could see people getting emotional, many of the people on this pier would have either worked on the ferry as cleaners or former staff of the company. As she turned the corner heading out into the North Sea for the last time bound for Denmark there was still a silence as the crowds headed home to reflect on what was a sad day for the people of Harwich. After 140 years two World Wars and many incidents, this marked the end of an era for the Harwich-Esbjerg route. We are adding more information to this site on a regular basis, if you wish to submit any photos or provide any information, then please use the contact page at the bottom of the screen. I wish to thank the following for their contribution to this project. DFDS, Ian Boyle, Derek Sands, and all those that have allowed me to use their photos.